After two years in limbo, the Eddie Aikau Big Wave Invitational is officially back. It’s all happening pretty quick, too. 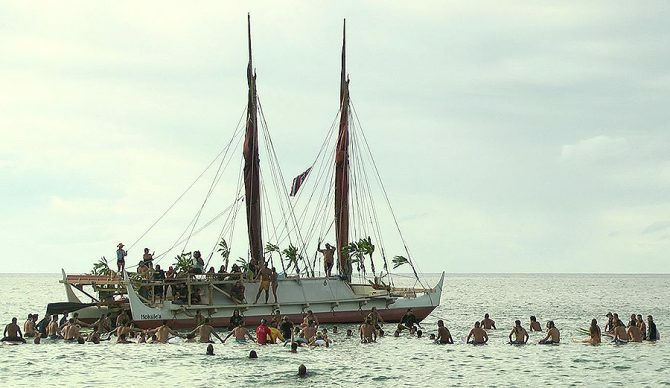 The news that the Aikau family had secured new sponsors for the memorial contest came out less than a week ago, and by Thursday afternoon a slew of competitors and fans had made their way to the North Shore for the opening ceremony. And now that the formality of an opening ceremony is complete, the contest window will be opening up immediately as well, running from Saturday, December 1 to February 28, 2019. After a whirlwind week of massive surf in Hawaii, a quick Google scroll and search through forecasts will hint that conditions for the contest might line up as early as having a go at it next week. But on Thursday, it was all about celebrating Eddie. Many of the invited competitors were at the Bay and if the contest does run for a 10th time this winter, it will be the first time a woman has competed. Fresh off her win at the 2018 Jaws Challenge, Keala Kennelly made the roster of 28 competitors with fellow Big Wave Tour Competitor Paige Alms listed as her alternate.